Our extensive range of Outdoor Adventure, Bushcraft and Team-building activities are designed to immerse children in the wonderful world of the great outdoors. By encouraging children to try activities outside of their comfort zone and believe in their own abilities, our residential trips for schools and groups help young people build confidence and independence, uncover hidden strengths and above all, have a lot of fun! Our residential adventure trip programmes are all-inclusive and fully adaptable to suit the age of your group. So whether you’re looking to strengthen your younger primary pupils‘ connection with the outdoors through fun, forest-school inspired activities, or help your secondary students build independence, skills building and resilience, we can tailor the ideal Adventure Programme for you. Bushcraft skills-based activities are a key focus of our adventure programmes. Through practical outdoor activities such as shelter building, water filtration, fire building and campfire cooking, groups of all ages have the opportunity to fully immerse themselves in the outdoors and learn more about survival and the practical uses of the natural resources around us. Our bushcraft activities can be tailored to suit the age and objectives of any group. They can be about play and exploration for younger pupils as well as learning new skills and building independence, resilience and teamwork for older children and young adults. Team-work is at the core of all our adventure programmes, and we encourage children to set team and individual goals, challenging themselves through perseverance rather than competitiveness, and supporting each other to overcome personal challenges. We use the outdoor space and natural resources around us for our team-building games and activities, designed to encourage strategic thinking, collaborative working and improve communication/social skills. Forest-schools recognises the benefits of longer term exposure to, and exploration of the natural environment. Perfect for primary schools, our forest-schools inspired activities include scavenger hunts, bug shelters, nature trails, woodland art, and hide and seek games to stimulate creativity and imagination whilst helping young people to learn more about the natural world we live in. Read our blog on the Top 10 outdoor activities enjoyed by children on our adventure camps. 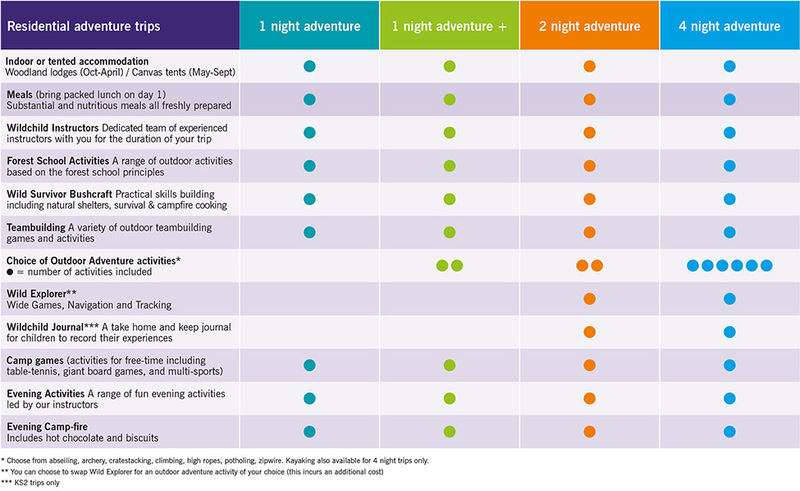 Our Adventure Planner highlights the number of outdoor activities included in each trip. Once you have made your booking your can choose your preferred activity or we can work with you to choose the activities most suitable, based on the age of your group, trip duration, and objectives. Groups staying for two nights or more can enjoy our Wild Explorer activities as part of their trip programme. Including wide games, tracking and natural navigation activities, the Wild Explorer session is a great way for groups to feel comfortable finding their way around natural outdoor spaces. The adventure doesn’t stop when the sun goes down! Our fun evening activity programme could include wide games, ambush, cresta run toboggans, or even a night-time safari on a bat detection mission! And of course no outdoor adventure day would be complete without an evening of games, stories and singing around the campfire. For a memorable end to your trip, why not use this time to channel the energy, creativity and inspiration generated by their time outdoors to perform your own Wildchild’s Got Talent evening!